I’ve been testing the Nexus 5 for the last three weeks and my intention was never to do another complete in-depth review and talk about the specs Iike Ryan’s (review) or Tom’s (review) but to give you my impressions coming from the Galaxy Nexus, the old dinosaur that Google officially abandoned a couple months ago. Since the Nexus 5 I had was only a loaner from Telus, I’ve been running it stock the whole time even if I was tempted to fiddle with it and install my favorite custom ROM Cataclysm, the same ROM I’ve been using on my GNex for the last 7 months… I’m sure Tom is proud of me for resisting! By holding my GNex right beside the N5, I was surprised at first but glad to see that the screen on the new beast is not much bigger. It’s fantastic as it won’t feel like I’m holding a phablet to my ear when talking on the phone and that’s a good sign for me that this size for a phone is the perfect one. I took a deep breath and started to install apps and load this baby up and organized all my screens. I didn’t feel lost playing around in KitKat as I had already played around with 4.4 on my Nexus 7. Funny enough, my first screen setup looked pretty much the same as my Galaxy Nexus one. It took me a few days of playing around to finally set my screen in a way that would last me the full three weeks. Everything about the N5 feels (is) better. After just five minutes of installing apps and organising widgets, I already knew that the next three weeks with the N5 would be very special. Unlike Ryan and Tom, I don’t get to play with many devices so to have the opportunity to play with a new flagship device is just plain awesome. I can’t really tell you how good the battery is and how long it lasts because my Nexus 5 has been ab(used) like I’ve never used a device before. Charging the N5 two to three times a day just became routine. Unlike my GNex, I was certainly not going to leave it in my pocket by fear of hitting another lag or misfocusing another picture! My only drawback about the screen is that unlike my GNex, the blacks are not black anymore. 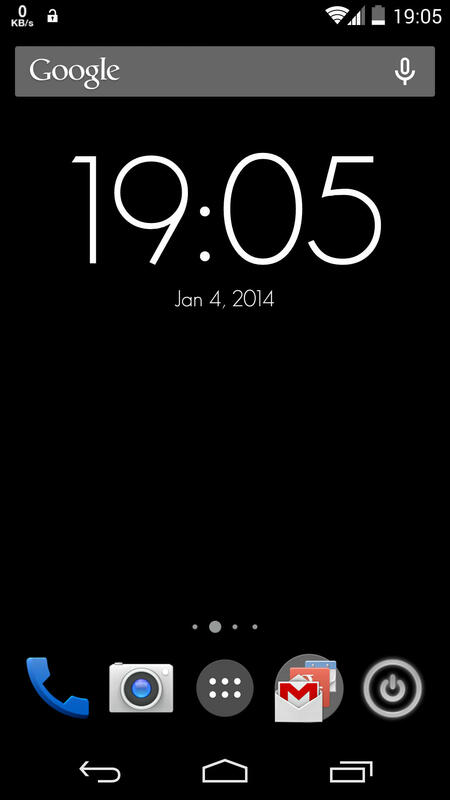 I did miss the AMOLED screen. Don’t scream at me for saying so, but screen resolution aside, my GNex has a better overall looking screen when we compare the two at the same brightness level.. Nothing special about the sound, I found it okay just like the sound quality on my GNex. When I want to listen to music, I usually use my bluetooth speaker anyways. What makes a difference this time is the location of the speaker on the N5. It was a bit of an adjustment in the way of holding the phone when watching videos especially. On the GNex, the speaker is at the back of the device so I often use my hand to curve up the sound. On the Nexus 5, the speakers are at the bottom of the phone so I didn’t really have to do anything in order to hear the speaker and it sure didn’t sound muffled at all when laying flat on any surface. I always say the camera is by far the most interesting feature on a smartphone. I could simply buy a Nokia Lumia 1020 with a Nokia Camera Grip (http://goo.gl/Wt1Qfz) and I’d be set for life. Unfortunately that awesome camera is surrounded by Windows and WP are not for me. I remember when I first got my GNex, the camera was so awesome but it quickly turned out to be a blurry mess in low light and also with little movement going on you’d get blur all over unless taken in very bright light. With the Nexus 5, it hasn’t changed much although it’s seems easier to end up with overall better quality pictures in low light conditions. Thanks to the quick update to 4.4.2, we all know that the focus got snappier and I was very thankful for that, otherwise my experience with the Nexus 5 camera would have been down to a simple meh. I used the HDR+ mode for all my pictures because I found the focusing to be quicker than in normal mode. This being said, I didn’t snap as many outdoor pictures as I wanted to because it’s been a really (I mean really!) cold Christmas here in Canada so most of my shots were taken inside with ambient light. I was disappointed with the camera when used indoor. Inside the house with ambient light, the movement from people moving around always resulted in blurry photos. With no movement in sight, the camera was awesome to work with and I’m sure the OIS helped a lot. Where the OIS really stands out was when using the video camera. It has a nice and stable 1080p recording mode but man, are those files ever big in size! On a 16GB Nexus 5, it quickly fills up the internal memory and then it takes forever to Auto-Backup on G+. After only a few days, I switched to 720p and was able to record twice as much videos and really, I couldn’t see a big difference in image quality when viewing on a 50” TV. Note to self: If I ever buy the N5, I need to get the 32GB version. One thing about the videos I’m not too keen about is the quality of the sound recorded. When you’re inside a quiet room with people talking, it sounds choppy, as if the mic would stop recording during the silence parts… it’s weird and hard to explain. It might have to do with the fact that the mic is now better at filtering the wind out but at the expense of ambient noises in more quiet environment? Since this is not my device, I had to use the phone fully naked. If you’ve been watching our Hangouts, you already know that I like my phone(s) fully dressed with a case and a screen protector. I played the game of shopping on eBay for the fun of it and I found the case I would get if I was buying the Nexus 5: http://r.ebay.com/bh1Baz. But this time, I might leave the screen unprotected just because it’s so beautiful naked. Now that I’m returning the phone to Telus, I will duplicate that exact screen layout I had on the Nexus 5 onto my GNex because it just worked for me. I’ve had such a good time using the Nexus 5 as my daily driver for the past few weeks. I could suggest this device to anybody. I’ve enjoyed running a pure stock Nexus device and quite honestly, if I ever own one, I’d probably try a custom ROM just to test and see and then go back to stock. Would I eventually root it? I would think so but who knows, I didn’t really feel the need to root it during the three weeks I had it other than that time I wanted to try an apps that did ask for root. Overall, a very fast device with no lag and an amazing screen that makes me want to bury my Galaxy Nexus six-feet under. For only $349 for the 16GB and $399 for the 32GB, you can’t expect the phone to be the best phone with the best camera available on the market but as they say, I truly believe it is the best smartphone for your buck available right now! Since devices can only get better, I can’t wait for the Nexus 6 to come out! (I can hear Ryan squeaking as I speculate on the Nexus 6 already!…) Ahahaha!